UVA's New Music Ensemble, under the guest direction of Greg Howard, will take the stage on Thursday, April 5th at 8pm in Old Cabell Hall. 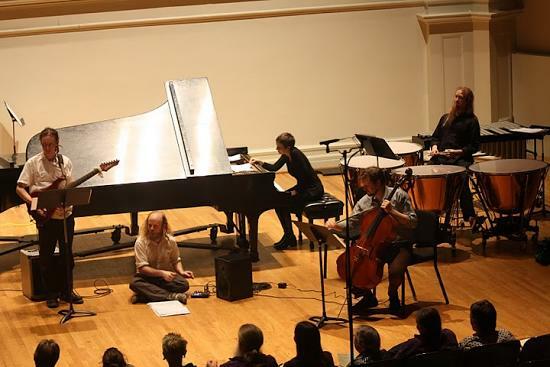 Made up of undergraduates, graduate students and community members NME performs contemporary interpretive works, often involving group improvisation. Ranging from playful and anarchic to lush and meditative, this Spring's concert will feature several works by ensemble members, as well as works by James Tenney, Michael James Olson, Jordan Noble. James Tenney's "Scend for Scelsi", an homage to Italian composer Giacinto Scelsi, explores microtonal harmonic processes made possible by non-standard or non-tempered tuning systems, with the ensemble providing an improvisational context for several members. Other pieces include Michael James Olson's "Altair", a multi-media piece, and Jordan Noble's "Möbius", a meditative piece where ensemble members progress individually through a series of looped phrases. NME will also perform pieces by ensemble members Alex Christie, Calder Hannon, and Greg Howard. NME Guest Director Greg Howard teaches Chapman Stick at UVA. He will be joined in this concert by assistant director Christopher Mega-Luna (piano), Alex Christie (saxophone), Becky Brown (harp), Jackson Patton-Smith (drums and percussion), David Joo (trumpet), Calder Hannon (electric guitar), and Catherine Monnes (violin).